There Will be Blood at the Gadsden Premiere Cinemas! No, Daniel Day-Lewis will not be showing up in Gadsden, AL nor will there be oil gushing from ground. However, today at Premiere Cinemas on Rainbow Drive in Gadsden, AL, from 1-7pm, the American Red Cross will be hosting a blood drive! Did you know that someone in the United States needs blood every TWO Seconds! And approximately 36,000 units of red blood cells are needed every day in the U.S. Thus, Premiere Cinemas and the American Red Cross are teaming up to do their part and we need YOU! Everyone who donates blood will receive a gift card for one ticket to see any movie!! Premiere is always proud to sponsor the American Red Cross in all of its efforts to provide blood and help throughout the world to those in need. 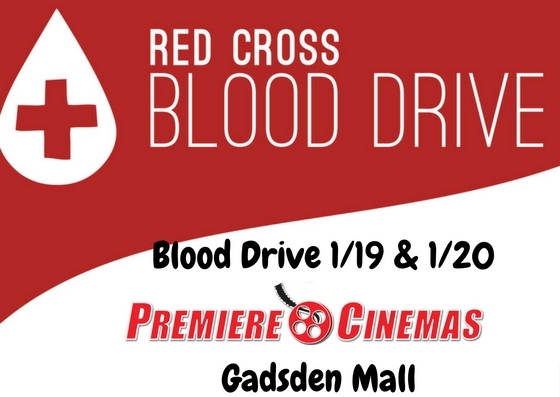 Premiere Gadsden Cinemas will be hosting the American Red Cross both today and tomorrow, Friday, January 19th/ 20th from 1-7pm. Gift cards for a free movie ticket are first come first serve and no rainchecks will be given.